This weekend saw two new firsts for my son, Xander. He has had a few racing related experiences so far, and has managed trips to race tracks since he was a few months old, and even got as far as sitting in Race Control and having his finger on the starting button. However, the two new events this weekend were both related to the Donington Historic Festival. Now in its fourth year, the festival is a fantastic May bank holiday weekend event with historic cars racing from various eras and in various formats. The first “first” if you like, was an exchange of pleasantries with a Formula One world champion for the first time. In fact, he managed it with a motorbike world champion too, as the man in question, John Surtees, is the only man to be world champion on four wheels and two. After a demonstration lap in a classic Lola, Xander and I were walking by the pit garage as the door opened up and John Surtees was getting out of the car. We were standing right at the exit of the garage, and as he came out, greeting his fans, Xander was on hand to wave and say something like “hello”, which was reciprocated. I thought this might well be the highlight of the day. However, Xander’s second “first” was rather special. The Melbourne loop had been converted to have demonstrations of classic rally cars and of racing carts, and there was a tent with a series of classic carts. Being the twentieth anniversary of the death of Ayrton Senna, and Donington having seen one of his greatest races, the 1993 European Grand Prix, there was Ayrton Senna’s 1979 racing cart. The marshall looking after the cart said, “does he want to sit in it?”, and motioned to Xander. 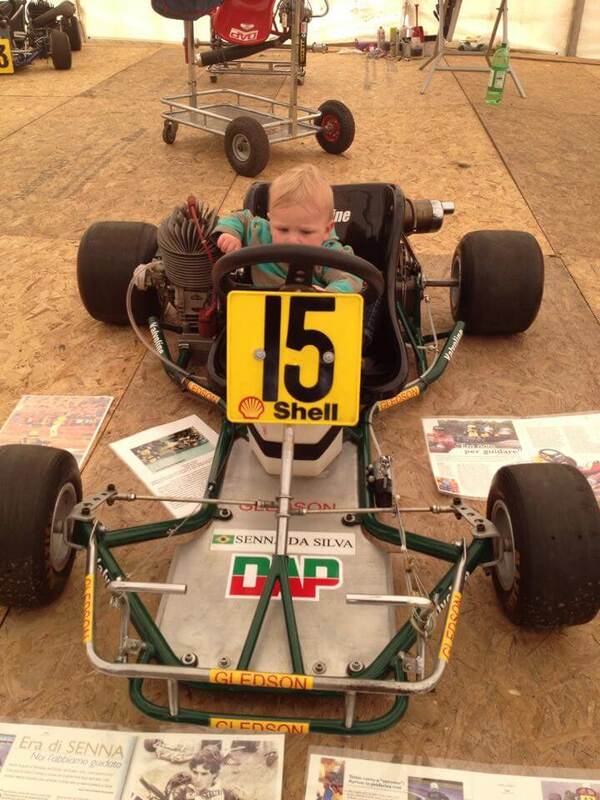 And so, the first cart that Xander sat in was Ayrton Senna’s 1979 Racing Cart. Xander somehow seemed less impressed with this than I did. As the marshall pointed out to me, this had probably just become the world’s most expensive pushchair. I took a photo or two, of course, so that I can tell Xander about it at a later date. I have a few photos from other parts of the Donington Historic Festival, but my paternal pride required me to share these ones first…. Family & Friends, Motor Racing Ayrton Senna, Castle Donington, Donington, Donington Park, John Surtees, Xander. permalink.